What is the most sinful food for you where your health is concerned? If you have the power to eliminate one food and make it happen that they never existed, what would it be? Mine would be pork. I know the harm that it can do to one's health especially when not consumed in moderation. 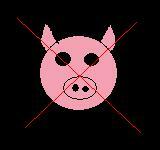 Not to mention the cruelty that the pigs undergo when they are being killed. What about you? id say pork too.. especially its fats.. i eat some of it, but you cannot avoid eating the fats..
Hi laiza! Thank you very much for your response. I eat some of its fats too. Well, it does taste good. It's really hard to avoid especially when you get used to eating it ever since you were a child. Oh, how I wish it never existed at all. Mine would have to be chocolate. I eat way too much of it. I need to get it out of my life. but I'm hooked. I don't eat much pork. At easter we have ham and sometimes we have bacon. but meat costs so much now days we are cutting back on all of it. There is no such thing as sinful food. Every food if taken in too little or too much is bad for our health. The best thing to do is to have food in moderate amount. All food are sinful, it's better that way. If you take one out, you will miss something out of it and it's not healthful. Why don't we just leave it as it is and control our eating habits? Agree?